EDB file to Adobe PDF converter is a standalone software, which intelligently export Exchange mailbox to PDF. It will save emails with their respective attachments as well as properties. No one will be facing data loss issue while attempting the conversion with this tool. The messages from Exchange database mailboxes will be exported in PDF file format. The tool saves every email in Adobe PDF file format and saves it in the associated folder of the item. For example, the resultant messages of Inbox will be saved in ‘Inbox’ folder. The software provides a very useful option of advance scanning through which it supports corrupted EDB files. It means that the emails of the corrupted Exchange database file will be recovered by the software and then, automatically be printed in Adobe PDF format. EDB to PDF file converter is providing an additional advantage to its customers that they can preview all mailboxes, before the conversion. All mailboxes from the browsed EDB files will be retrieved by this software. Users can have a look upon them before printing them in PDF. Instead of saving all folders and sub-folders of Exchange database file, users can export selective folders through this software. The application will export emails of only those folders, which are selected by the end user. No extra efforts are needed to perform this filtering. 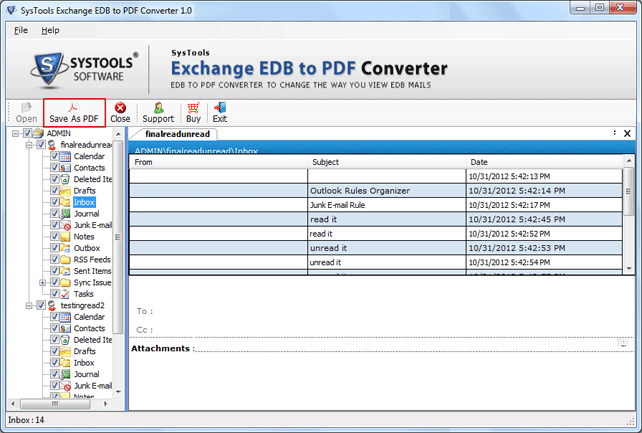 Exchange EDB to Adobe PDF file converter enables users to save emails of public as well as private folder of Exchange in PDF file format. No matter what is the size of EDB file or how many numbers of mailboxes are there in a file, the tool is independent of both these factors. 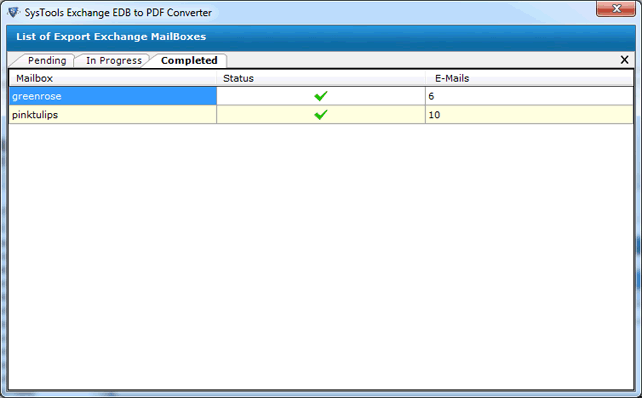 Demo version of Exchange Mailbox to PDF Converter scan & preview of all items of Exchange mailboxes. 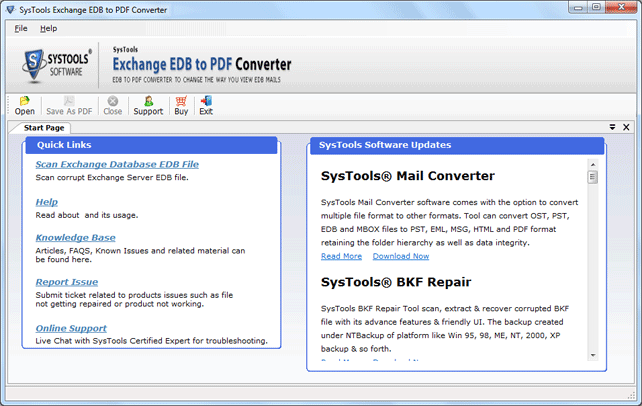 Is it possible to perform selective EDB emails conversion to PDF with your tool? No, this feature is currently unavailable in EDB to PDF converter. Our developers are programming this feature in upcoming version of the tool. What is the limit of mailboxes, which an EDB file needs to have to work with your tool? There is no mailboxes limit imposed in the software. ‘n’ numbers of mailboxes can be there in EDB file to export Exchange mailbox to PDF. Does the converter requires any preinstalled program to work with it? No, the software is an independent solution to convert EDB emails in PDF format. The only thing is that EDB file should be in the offline mode to exhibit the conversion procedure. Can I browse 2 EDB files together for converting their mailboxes emails in PDF file format? No, at one time, the tool will processing several mailboxes of one EDB file only. It supports bulk mailboxes conversion from EDB to PDF file with no limit on file size of Exchange database. Will your software work upon Microsoft Windows 7 operating system? 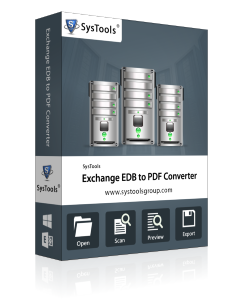 Yes,our EDB to PDF converter is workable on almost all editions of Windows. You can smoothly download and install them on any OS. Is there need of any Exchange server credentials to work with your tool? No, not at all, the software only requires dismounted / offline EDB file. There is no need of any kind of the server credentials to work with this utility. Waoooo! 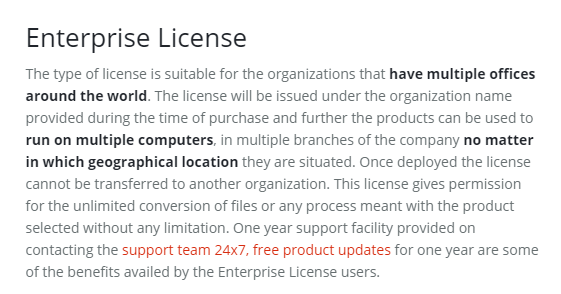 This was the first one word when I used free version of the software. Earlier I used to manually print my EDB emails in PDF just by taking screenshot. One day I was doing the same and my brother came to me. He saw me doing this and fortunately told me about this only software. I took his words and tested the free EDB to PDF converter. I was so impressed that I leveraged to the full version and now I am using it daily on regular basis. What to say about this software when this is the only product in market, which provides simple conversion from EDB emails to PDF format. Before purchasing the software, I gave a thought that would it be of any worth? But now after using the tool, I can proudly say that spending dollars on this application is of complete worth and time consuming, as well. I highly appreciate the hard work of the team who thought of coming up with such tool! There is no manual trick by which we could have copy of essential Exchange messages in Adobe PDF format. So, the only measure left is to go for a reliable tool. I started googling for the same and in the first weblink only found this software. Initially, I tested the product with small EDB file and it gave me amazing results. After this, I contacted to the support team and asked them guidelines to purchase it. Seriously, they also helped me a lot. Believe me! It was an amazing experience for exporting exchange mailbox to pdf!